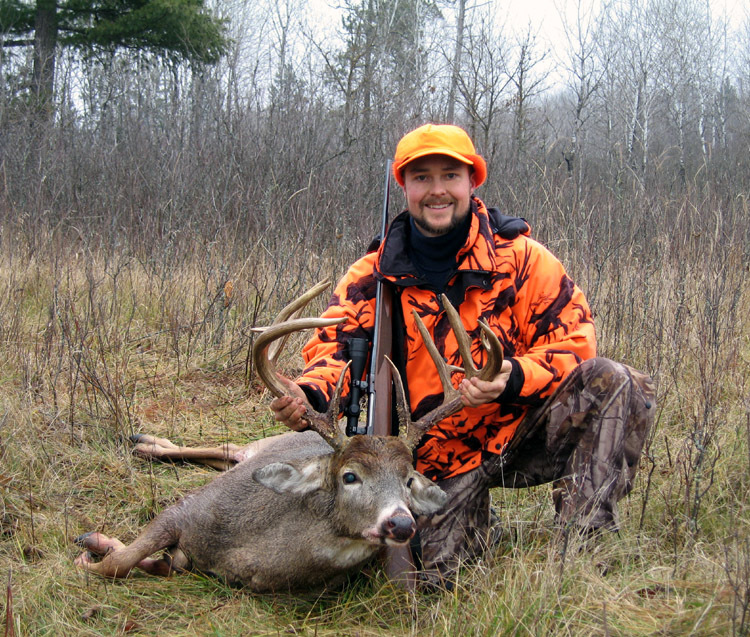 The other hunters (my brother and his wife) arrived in camp on Friday, eager to see the giant 18 pointer of mine they had heard so much about. During plenty of celebrating that night, we talked about our deer plan for the next day. I offered to bring Jessi to one of my alternate stands nestled in a pinch point along a creek bed a half mile upstream from my spot. Matt figured that if I'm out there at pre-dawn, I might as well hunt the morning since there's still two buck tags left. I asked him what I could shoot and he said "a nice ten with a big rack, outside the ears, something like a 140-class or better". Cool. So it was a wall hanger only for me and I always love those scenarios. No pressure. I figured I'd only shoot a 160 or better, considering I already had a Booner in the box from a couple days ago. The weather was ugly. Blustery cold, freezing rain and sleet. Issh. I walked Jessi out to the stand and then made my way out to my trusty spot overlooking the finger of woods between two beaver meadows. I was really blowing around and swaying in the wind at the top of my white pine. Rain was coming down pretty good in phases. At 7:25am I noticed a deer making his way across the far end of the meadow. He was at about 400 yards and going away from me. After glassing him, he looked like a nice buck and I really wanted a better look at him. 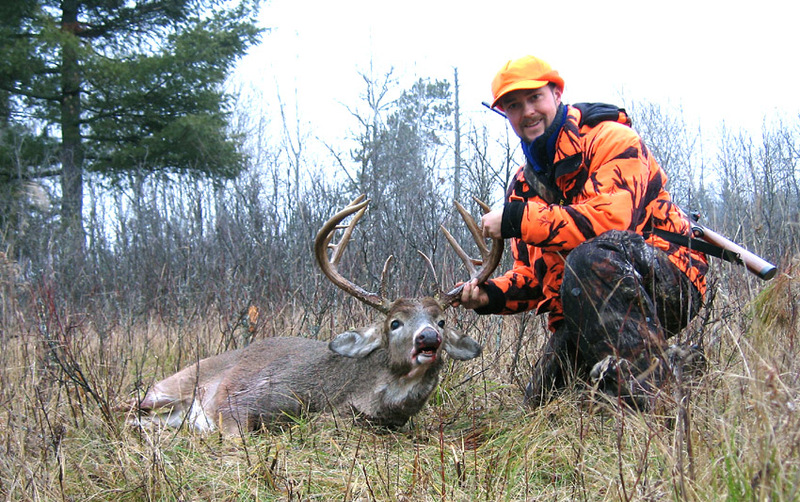 I figured what the heck, I'll try to trick this guy with the old rattling antlers hoax. I crashed them together a bunch, competing with the strong winds. Sure enough, after a short series I got the buck to stop and completely change direction, back towards me. He wasn't sure of the sound source and my wind was good. 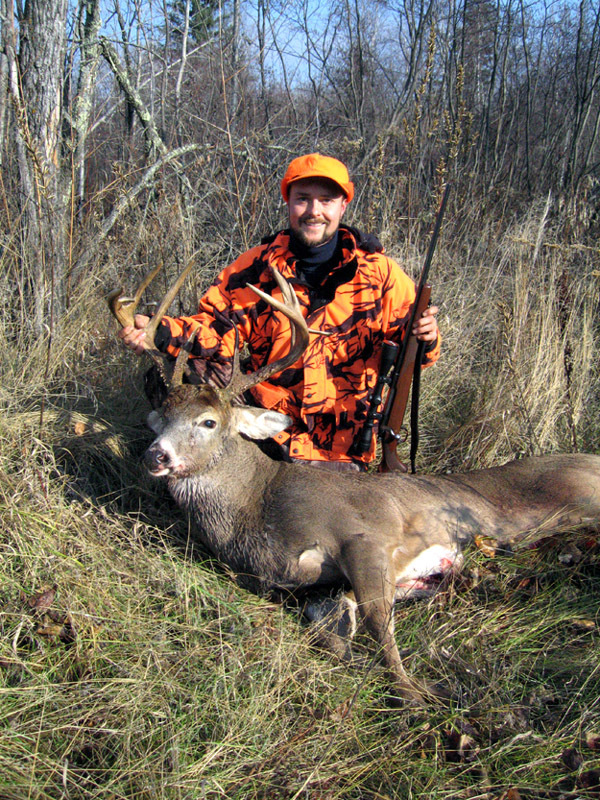 Through the bincos, he basically looked like a very nice ten point. He appeared to be outside the ears and tall, but that was all I could gather at this distance. Then he lost interest and made his way into the thick woods, still probably 300 yards out. I conducted a few more series of rattles and calling, hoping to coax him even closer. He was out of sight, so I just put the tricks away for now and hoped for the best. Moments later I heard movement from the same chunk of woods, but remarkably closer, now only 80 yards. Had this nice buck been so curious to cruise through that much thick cover to investigate the source of the rattling commotion or was this an entirely different deer?? Just then I spotted him, he was moving closer to me through the finger of brush. It was him, the same big ten! Wait a second. He's got something interesting about his rack! 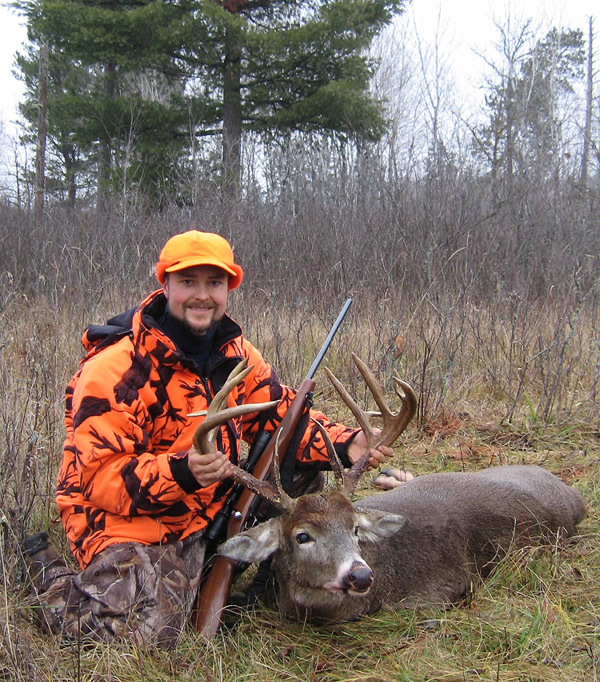 Does he fit my deer camp's criteria? Is he a wall hanger? He stopped for a moment and that's when I noticed some sort of flyer points coming off the back of his rack!! 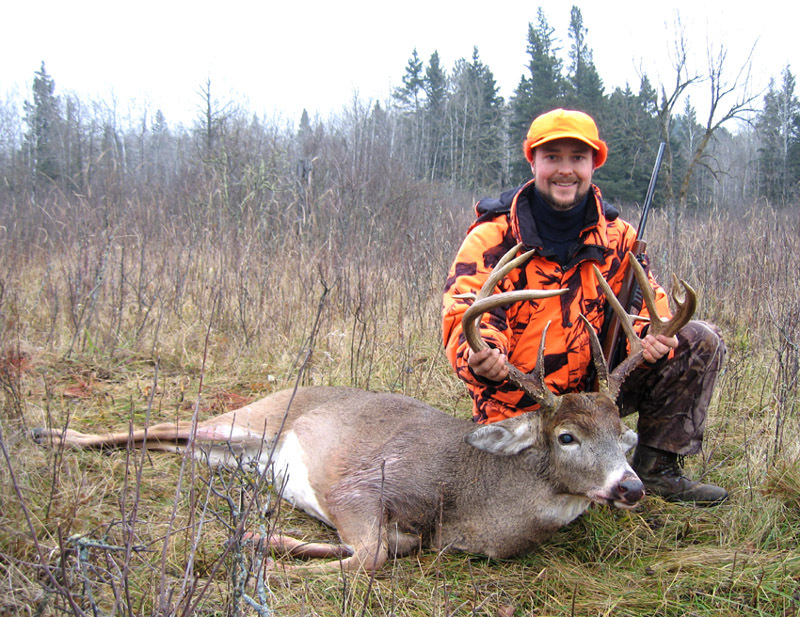 Matt had suggested that I radio him if I had a good buck in my area and was unsure whether or not to shoot. This guy was an obvious big hoss with some gnarly character. I waited carefully as he made his way around my tree, a mere 50 yards from the base. He got to a small opening and I let him have it. 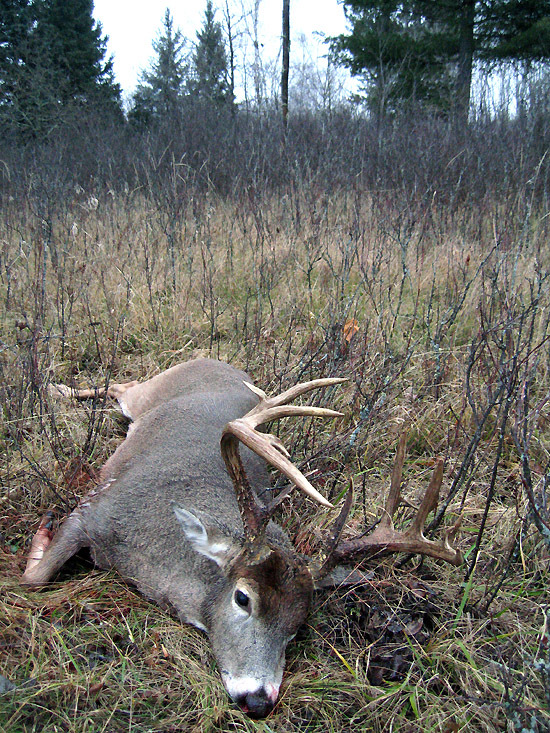 He ran solid for about 75 yards and piled up in the clearing, just barely within view. 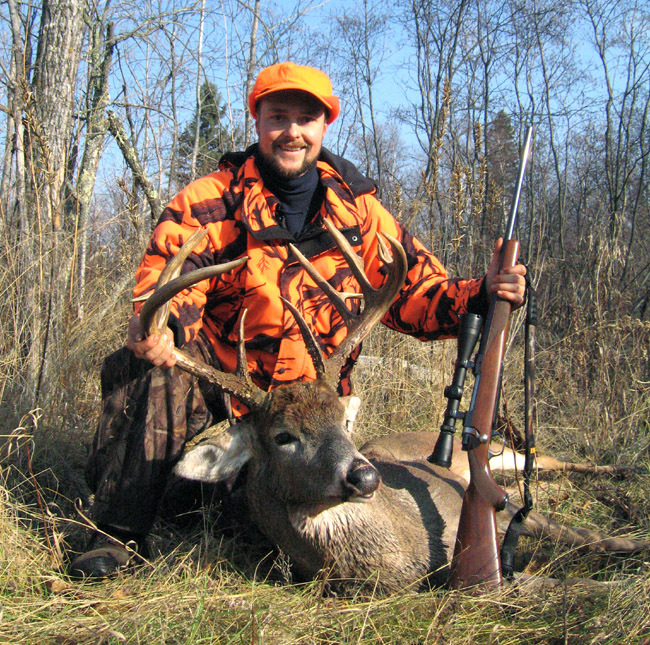 I looked at his rack through optics and could see that he had some nice antler, another big hat. As I approached him, I wasn't sure what to expect. Only ground growth here, as he turned out to be much more impressive than I imagined. 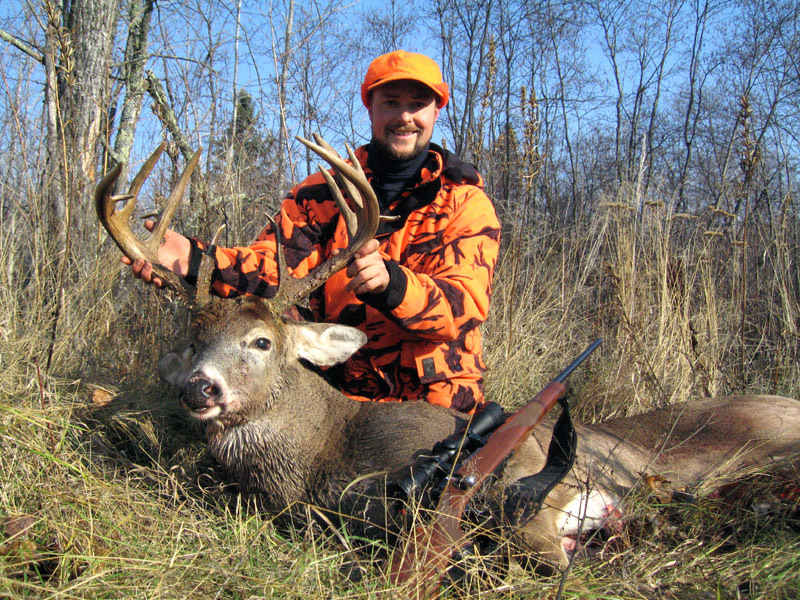 He had matching four inch flyer points, big gnarly tines, killer brows, a split G4, massive sweeping main beams and a unique golden-polished brown rack. ANOTHER MONSTER!! No doubt about this one either, this is why we're all out there in the woods. How do you pass up a buck like this? It's been a magical season for us.